Old map by BIBLE. -13th.century Bible leave. Size: 11.0 x 7.2 inches. 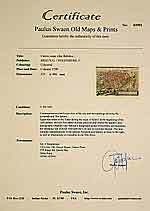 Condition: In very good condition, small repair in the bottom-left margin. Wide partly original margins. Clean flat vellum, and very clear writing. 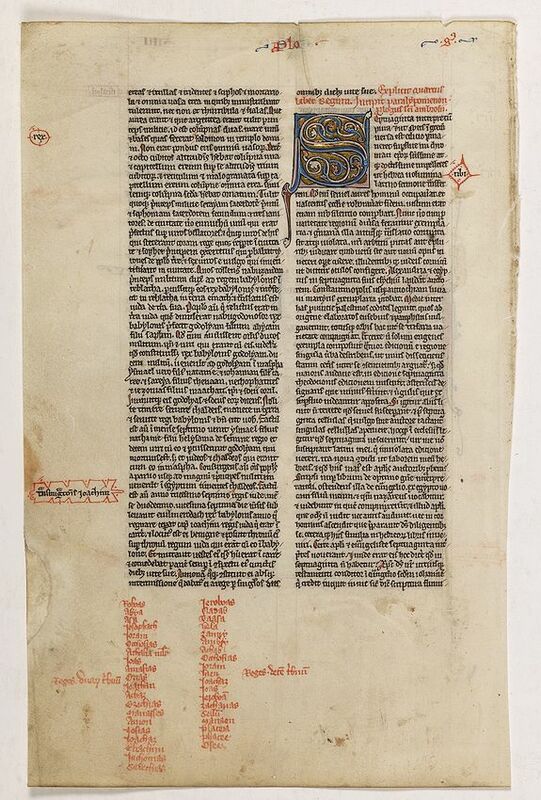 Large leaf from a 13th.century French bible, written on vellum in black ink, two columns, 53 lines of text. RECTO: On top is written "GU(M)" IIII, second half of REGUM IIII (fourth book of kings). Two large initials in red and blue, with penwork extending initial the margins. VERSO: Large capital "S", 8 lines high in blu, red and sparkling burnished gold 30 x 30 mmn. The text in red reads "Eplicit quartus liber Regum. Incipit paralypomenon. Prologus sancti Ambrosii"
Underneath a list if kings in red. In the margins some contemporary added corrections to the text.